Home > Technology & Finance > What is Gift Aid and How Does it Affect My Fundraising? When it comes to fundraising, you want to ensure that you’re being cost-effective down to the very last penny. When effort is being put into earning money for a worthy cause, every possible way of making money needs to be considered carefully along with any ways of saving money or making extra through government means. Gift Aid is basically a tax relief that is allowed on any money that is donated to UK charities. 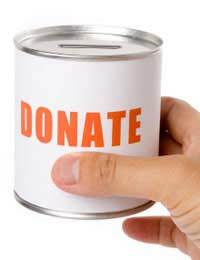 The government treat these charity donations as though the donor has already deducted basic tax from them, which in turn means that the charity can then reclaim this. The benefit of this is that the charity then increase the value of a donation, so if you’re a fundraiser, Gift Aid is definitely something that you should find out more about. If you’re an individual who enjoys donating money to charity, you should register for Gift Aid so that you are able to help out your charity further. When you give your charity a gift aid declaration, you should include your name, home address, charity name, donation details and confirmation that you’ve paid UK tax to cover the tax that the charity will reclaim. For a basic-rate taxpayer this adds approximately 28% to the value of any donation made under Gift Aid. You can now actually make your claim verbally, but if you choose to do this, the charity you’re claiming Gift Aid on must confirm it in writing and keep a copy of the declaration. You can make a gift aid declaration for any individual donation you make, or you can claim for a series of donations or future donations. Whichever situation you’re in as an individual fundraiser, you should definitely use Gift Aid as a way of maximising your donation. The benefits of Gift Aid are undeniable for both charities and individuals. It is definitely worth while getting as much information as you can to see how it can be used effectively in your fundraising cause.